Magical Wizard of Oz playground has ruby red slipper slides, flying monkeys, a yellow brick road and more! Playgrounds are a natural place for kids to play, explore, and daydream. For the children of Prince George's County in Maryland, that creativity just got a boost from the opening of a new Wizard of Oz themed playground. 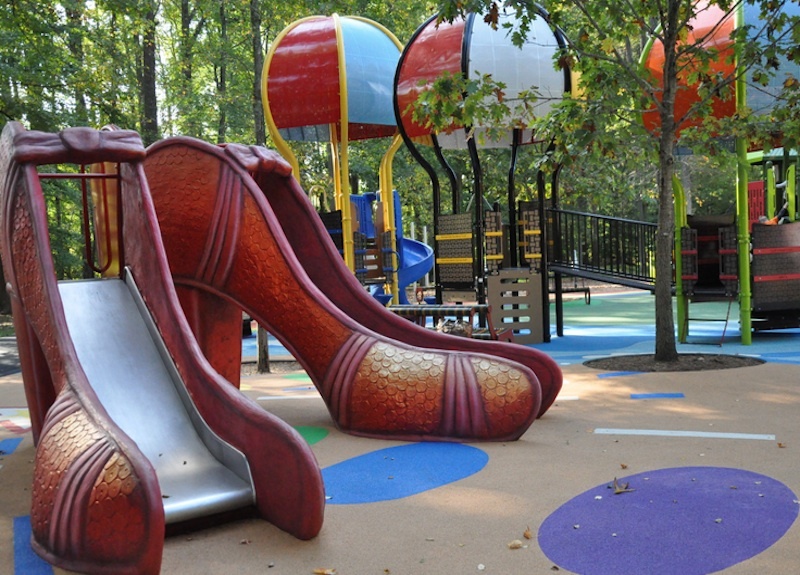 From ruby red slipper slides to flying monkeys suspended in trees, this playground is the ideal environment for little ones to discover the magical world of Oz and its inhabitants and to create their own little worlds of imagination. 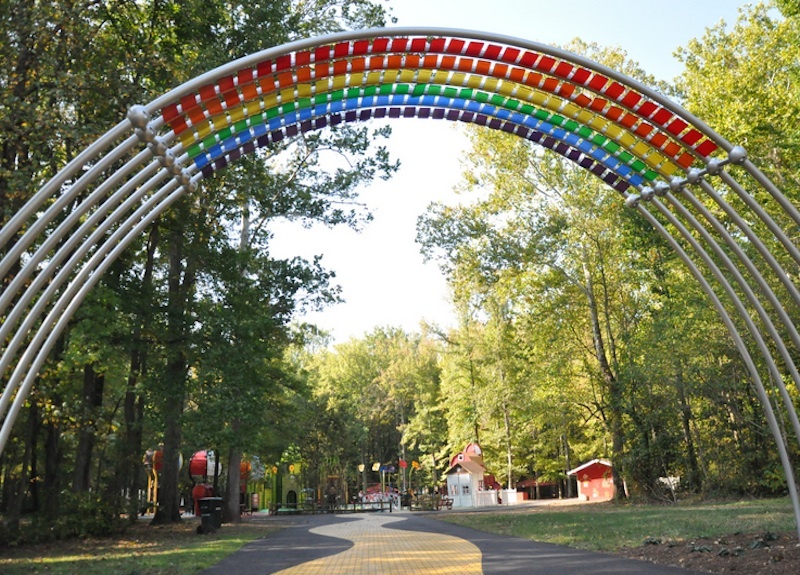 And in case you were wondering, yes, the entrance to the park comes complete with a yellow brick road to follow and its arching rainbow above. Designed in part as a reaction to the high rates of childhood obesity in the surrounding areas as well as a cutback in physical education and recess times at school, the playground features 14,000 square feet of fun. Among the attractions are two side-by-side red slipper slides, the towers to the Emerald City (with plenty of climbing opportunities), Auntie Em’s house, and musical chimes. A welcoming plaque introduces park and playground-goers to the magic that they are about to experience. Of course, the entrance to the park wouldn’t be complete without a yellow brick road to follow and its arching rainbow above. The larger structures such as the emerald city and the hot air balloons create enticing areas to play and learn in: the hot air balloons actually feature an interactive word search. The smaller details are equally as cool and fun to discover: trees with faces, poppy flowers for kids to whisper into, and large, stylized boards of the Cowardly Lion, Dorothy, and the Scarecrow with face cut-outs give subtle and overt nods to the cinematic classic. Designed in part as a reaction to the high rates of childhood obesity in the surrounding areas as well as a cutback in physical education and recess times at school, the playground features 14,000 square feet of fun. Among the attractions are two side-by-side ruby red slipper slides, the towers to the Emerald City (with plenty of climbing opportunities), Auntie Em's house, and musical chimes. A welcoming plaque introduces park and playground-goers to the magic that they are about to experience. The larger structures such as the emerald city and the hot air balloons create enticing areas to play and learn in: the hot air balloons actually feature an interactive word search. The smaller details are equally as cool and fun to discover: trees with faces, poppy flowers for kids to whisper into, and large, stylized boards of the Cowardly Lion, Dorothy, and the Scarecrow with face cut-outs give subtle and overt nods to the cinematic classic. The Wizard of Oz playground is one of 26 "imagination" playgrounds. If the other 25 are anywhere as inspiring as this one, we think the children of Prince George County will agree that "There's no place like home... or our local playgrounds!"